Founded in 1987, Italy-based RGI Group specializes in software products for insurance companies, covering the entire spectrum of insurance policy management through the provision of individual software and advisory services. The group has more than 100 clients including the world's most prominent insurance companies to which it also offers application maintenance services. RGI Group, which expects to close 2017 with a turnover of €70 million, of which 75% is generated domestically, employs around 800 people in Italy and abroad. Alessandro Soprano and Sascha Pfeiffer, Managing Directors of GCA Altium, commented: "With its strong positioning in Italy and in France, RGI is uniquely poised to become the European leader in software for insurance policy management. We are convinced that Corsair Capital is the ideal future partner to continue the internationalization process." 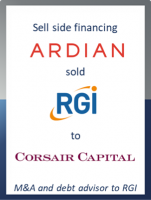 Vito Rocca, CEO of RGI Group, stated: "I sincerely thank Ardian and the whole team of professionals for their important support of our international growth. Now we are starting a new phase of our journey together with another excellent partner, with whom we will continue to work side by side in order to consolidate our growth strategy." Paolo Bergonzini, Head of Expansion of Ardian in Italy, commented: "We have supported with passion the development of RGI’s business over the last three years. Together we achieved many successes, also thanks to RGI's leadership in its sector and to its top management, with whom we have always had a relationship of trust and collaboration." Corsair Capital Managing Director, Raja Hadji-Touma, said: "We believe that the insurance industry has an increasing need for high quality core system solutions that help insurers streamline and digitize business critical processes. RGI’s comprehensive and modular offering has been widely recognized by clients and industry participants as a leading solution in the insurance market. We are looking forward to working hand-in-hand with RGI’s management to further develop and expand RGI’s business opportunities internationally through our long-term strategic investment."